Burt Reynolds is reunited with the Bandit that started the phenomena after 40 years. Renee Martino, an 84 year old sweet Grandmother who rescues dogs and owns SnuggleInn Doggie Resort in Anderson SC, dedicated to dog rescue and boarding, has a passion for Burt Reynolds and Smokey and the Bandit and a life long dream of meeting Burt Reynolds. Last month her dream came true! Renee happens to own the most iconic Trans Am in the world, without even knowing it! Renee was on a mission to find a Trans Am that starred in the movie "Smokey and the Bandit" and sent her son, David Martino, on a mission to locate the car. David, after researching and searching for years, finally discovered and realized that all the actual Trans Ams in the "Smokey and the Bandit" movie where destroyed during filming. After giving up hope, David and his mother decided to get a Trans Am that would resemble the "Bandit" car , black with gold pin striping. After further searching, David found a 1976 Trans Am LE 455ci Hurst T-Top AC car in Virginia. David and his mother thought it was cool that only 110 where made, so they decided to purchase the car. When they received this special Trans Am, they saw that the car came with a great amount of documentation from "PHS", Pontiac Historical Society. After reviewing the information, Renee and David could not believe their eyes since this actual car was the first 1977 SE "Bandit" Trans Am in the world and was the "Official" Pontiac brochure promotional car for all 1977 SE "Bandit" cars! They were unable to sleep and believed that God had sent them a real gift! Renee wanted to find a safe environment for her new found love so she contacted Trans Am Specialties in Miami, Florida, and told them what she had bought. Rick Deiters, owner of Trans Am Specialties offered to house the car at his facility. Rick stated to the Martinos that they had a very special Trans Am and the car is an iconic collectible and highly valuable. Pontiac's exclusive magazine, "Smoke Signals", contacted Rick and wanted to write a story regarding the Trans Am and do further research, after doing a forensic study and confirmed everything "PHS" Pontiac Historical Society. Smoke Signals Magazine is dedicated to only Pontiac cars and are in close contact with historians who worked with Pontiac back in the day. Amazingly, not only did they confirm everything about the car, they found new important information regarding this specific vehicle and ran a front page & 3-page spread article. The Martinos were overjoyed and Renee was the happiest she had been in years. A new beginning for Renee's dream! Now for the biggest surprise of all! 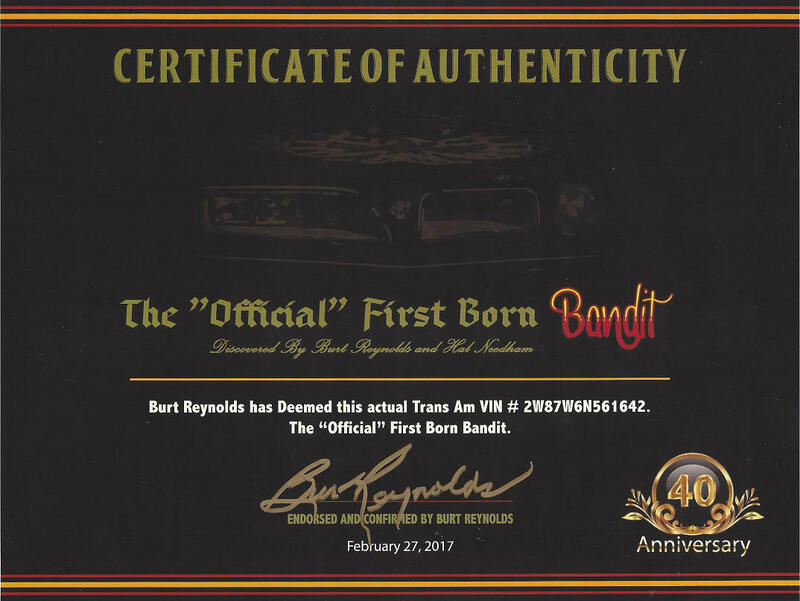 Rick Deiters of Trans Am Specialties received a call from the Burt Reynolds Foundation inquiring if Rick has a 1977 Bandit Trans Am & Rick informed him that he just so happened to have a have a very special one. Gene Kennedy from the Foundation asked if Rick could bring the Trans Am to the San Carlos Institute in Key West . Burt Reynolds was attending the film festival due to a Smokey and The Bandit documentary theme, and Mr. Reynolds wanted to have a 1977 Trans Am parked at the entrance to the festival. Trans Am Specialties accompanied the car to the festival. Burt arrived with a big smile from ear to ear when he approached the Trans Am & was greeted by Rick Deiters with the original Pontiac brochure in hand that featured this actual car. Mr. Reynolds signed the brochure & attended the festival that was front page news of the Key West Chronical. Two days later, Rick Deiters received a call from Gene, Burt Reynold's agent, informing him that Burt had been asking him why he signed the Pontiac brochure & wanted to know if there was a connection with the car in the brochure and the actual car sitting in front of the center. Rick Deiters confirmed that this was the actual Trans Am in the brochure and was Pontiac's promotional car and was in every brochure catalog in 1977. Within two minutes of Mr. Reynolds receiving this news, his agent Gene called and said Burt was astounded by this news could not believe this at was the actual car that started the Smokey and the Bandit "Phenomena". Hal Needham and Burt Reynolds saw this actual brochure with this car featured and it was love at first sight for Hal and Burt and at that point it was decided to use a 1977 SE "Bandit" Trans Am for the movie. If they had not seen this Actual Trans Am in the brochure, the "Bandit" would have been another make car. It was fate that brought Burt and the Trans Am together again, ironically, during this 40th Anniversary year of the Smokey and the Bandit movie. It was a dream come true for both Burt Reynolds and Renee Martino! Burt was so excited invited the car to his estate in Jupiter and wanted to film and take picture of the car..Burt Deemed this Trans Am "The Official First Born bandit" and signed a certificate to endorse the car...This is a unbelievable event that took place Rene was a catalyst to reunite Burt with the Trans Am that started the Smokey and the Bandit Phenomena. Saving all those innocent poor dogs paid off and this is a dream come true for Burt and Renee.